The National Mall in Washington, D.C. — the 2-mile-long expanse of open space extending from the U.S. Capitol to the Washington Monument and the Lincoln Memorial, and from the White House to the Jefferson Memorial — is a unique symbol of our American democracy and a national gathering place for civic celebrations and demonstrations. The monuments, open spaces, and majestic vistas represent the historic legacy of the L’Enfant Plan of 1791 and the McMillan Plan of 1901-02 for the Nation’s Capital. In 1791, at George Washington’s request, Peter (Pierre)* L’Enfant drew up a plan for a city 10-miles square and centered on the Congress House (Capitol). The L’Enfant Plan laid out the Nation’s Capital as a physical embodiment of the newly ratified U.S. Constitution. The Capitol Building marked the city’s center and highest spot. Broad diagonal avenues named for the 13 colonies overlaid a grid of residential streets. Pennsylvania, site of the Constitutional Convention, gave its name to the avenue connecting — and separating — the Capitol and White House. Circles and rectangles formed at the intersections of avenues and streets were to be sites for monuments, memorials, and public buildings. 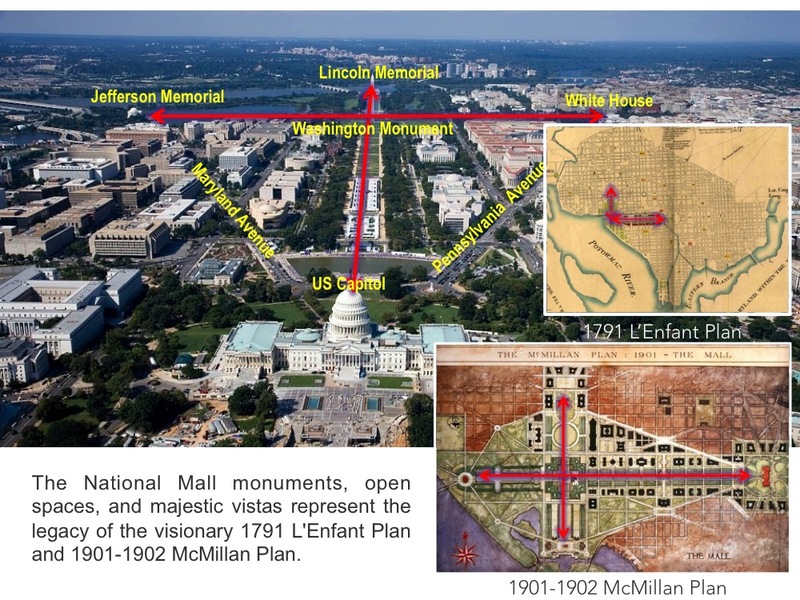 Within this vision of great symbolic spaces, vistas, and public buildings, L’Enfant planned the Mall as a 400-foot wide Grand Avenue (shown in green in the plan at right), extending from the Capitol westward to the Washington Monument (marked “A” in the plan) at the banks of the Potomac River where it intersected the White House axis (marked “President’s House” in the plan). He described the Mall as a “place of general resort” and, echoing Thomas Jefferson, a “public walks”, a tree-lined promenade flanked by public buildings such as theaters, academies, and assembly halls. *L’Enfant called himself “Peter” and not Pierre. See Kenneth R. Bowling, Peter Charles L’Enfant: Vision, Honor, and Male Friendship in the Early American Republic, 2002. This 1900 photo shows the Mall covered in trees and a train (see the white puffs) crossing on tracks in front of the Capitol. This 1892 print illustrates the chaotic environment and the location of the Washington Monument near the banks of the Potomac. By the end of the 19th century, haphazard growth resulted in the Mall being covered with trees and gardens, a variety of public and industrial buildings, and the Baltimore and Potomac Railroad station and tracks at the foot of Capitol Hill. The McMillan Plan revived and extended the L’Enfant concept of the Mall as a broad and open vista. The Commissioners, who included renowned City Beautiful architects Charles McKim and Daniel Burnham, landscape architect Frederick Law Olmsted, Jr., and sculptor Augustus St.-Gaudens, envisioned the Mall from the Capitol to the Washington Monument as a continuous green park framed by rows of elms and white classical museum buildings. The McMillan Plan more than doubled the size of the Mall. It extended the Mall westward and southward of the original Potomac River shoreline (marked in blue, below right) onto landfill to form new parkland and sites for the future Lincoln Memorial and Jefferson Memorial. The Washington Monument, originally the western boundary of the Mall, became the centerpiece of the Mall symbolic cross-axis (Capitol to Lincoln Memorial axis intersecting the White House to Jefferson Memorial axis) as illustrated at the top of this page. The McMillan Plan is the design basis for the Mall today. The McMillan Plan slowly took shape on the Mall during the twentieth century. The nineteenth century trees were finally removed from the area between the Capitol and the Washington Monument in the 1930s. Temporary buildings erected during World War I and World War II to the north and south of the Reflecting Pool, and at the base of the Washington Monument, were finally taken down in the 1970s. The Mall became our nation’s premier public forum in the twentieth century, a full expression of the L’Enfant concept of the Mall as the people’s place. It has grown in meaning as the people have made new history on its sacred ground. 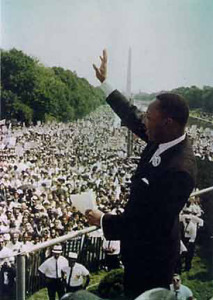 The Lincoln Memorial is now associated also with civil rights, dating back to Marian Anderson’s concert in 1939, and including the March on Washington in 1963 and Martin Luther King, Jr.’s “I Have A Dream” speech. 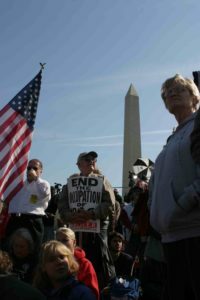 The monuments to American founding principles, and the open public spaces stretching between them, have provided the stage for innumerable public celebrations, civic gatherings, and demonstrations.